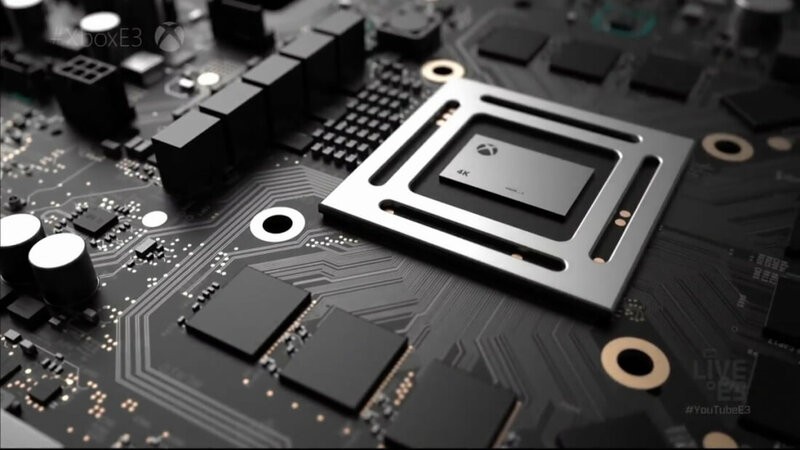 Microsoft unleashed a torrential downpour of Project Scorpio information last week although unfortunately, we didn’t get to see what the actual hardware looks like. Such remains the case but we do have the next best thing to share today: pictures and renders of Project Scorpio dev kits. Gamasutra, which recently paid a visit to Microsoft, walked away with a handful of images and additional information regarding a system that is blurring the lines between mid-generation refresh and brand new platform. As you can see, the machine somewhat resembles an Xbox One S albeit slightly larger. It packs a number of features like programmable buttons, extra USB ports, a front-mounted display and a battery backup that won’t make it to the final consumer release but will make it easier for partners to build content. The dev kit now vents warm exhaust air out the back and sides of the machine, a small but important change that allows developers to stack kits on top of each other without having to build makeshift spacers to help with cooling. Something else worth noting is the fact that the dev kit is more powerful than the retail console will be, packing 44 CUs on the GPU (instead of 40 on the retail version), 24GB of RAM (twice as much) and a 1TB solid state drive. The idea, it seems, is that Microsoft wants devs to build their games big then be able to tune them down to run on the Scorpio or other Xbox One consoles. Project Scorpio dev kits will be shipping out to select developers in the coming weeks.